If you ask any lawyer they will tell you it’s nearly impossible to convict someone based solely on circumstantial evidence. You need proof like eye witnesses and DNA evidence. But since this isn’t a court of law, let’s look at the circumstantial evidence out there that supports and detracts from the Omnirumour, specifically within the state of Doctor Who animation. Moonbase: This is the funny one out of the whole bunch because it’s the only story I’m going to mention that has actually already been animated. The story has been previously been available as a part of the Lost In Time dvd set, but they animated episodes 1 and 3, making the story visual complete and released it on its own. Many have argued that the animation proves that this story wasn’t found, that the BBC wouldn’t have sunk money into something that it doesn’t need. The flip side of this argument is that maybe the animation was already completed, nearly completed or already paid for before Phil Morris found his alleged big haul, therefore there was no point in stopping or withholding the animated episodes. If you follow along with that logic, releasing them would also be a great way to downplay the missing episode rumours and an extra dvd on the release schedule would buy them a few more months to prepare for whatever is coming next. Underwater Menace: Here’s where things really get sticky and murky. Underwater Menace was supposed to be released at some point this year. I can’t say 100% whether it was ever officially on the release schedule, or whether they ever officially mentioned that the missing episodes were to be animated. But whether anything ‘official’ was ever announced, I and many others like me, were at least under the impression that it would have the missing episodes animated. It fit Dan Hall’s animating criteria (that there be two or less episodes missing) and the fact that recently recovered episode 2 has yet to be released on dvd only added to our certainty. Planet 55 was supposed to animate it, but that has been delayed or outright cancelled depending on who you believe. There was no real reason stated for the delay, just that the Planet 55 is working on something else first. I found this extremely hard to believe, at least until this article was published. Maybe the lack of resources has actually significantly slowed their ability to work effectively. Crusade: Years ago Dan Hall did an interview on a podcast and he suggested that they might do more animations. I was ecstatic because at the time only the Invasion had been released. It was in this interview that he set out the criteria for animation candidates that I mentioned above. I remember immediately making a mental list of all the stories that we were sure to see animated. That list went something like this: Reign Of Terror, Tenth Planet, Moonbase, Ice Warriors, Underwater Menace and The Crusade. Now there are only two from that list that are still missing from my shelf, Underwater Menace and The Crusade. While we have a lot of information and speculation about UWM, practically nothing has been said about The Crusade! 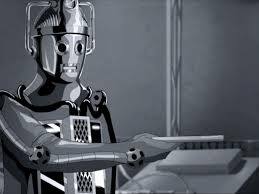 Just like Moonbase, it was originally released on Lost In Time, but would greatly benefit from animation. I’ve heard no official or unofficial mention of a possible animation, even though it meets said criteria. There’s a facebook page that was started in the hopes of getting it animated but the page seems to have died a slow death over the course of the omnirumour. Why has this story never been talked about for animation? Is there something in the story specifically they don’t like and want to keep tucked away? It is a somewhat racy story, depending on your tastes, but surely any Doctor Who, even one with a lot of warts, is worthy of being properly released? Web of Fear Episode 3. After everything that has already been said in this article about the state of animation, why would they release Web of Fear with just a reconstruction of episode 3? It’s the only story in the entire dvd range to be released with an incomplete episode that’s not animated (not including Shada, of course). You have to wonder why? It’s not like it was rushed out right at the 50th like Enemy Of The World. It took three more months for this one to make its way onto dvd shelves. We already know that they had those missing episodes back for a while (how long is a debate I won’t get into here), so why didn’t they animate it before releasing? It would have been a great incentive to get itunes purchasers to double dip on the actual dvd. Omni proponents show this lack of monetary investment into a prize possession to mean that the BBC knows there will be a recovered episode 3 someday, maybe even someday soon, so there’s no point wasting money on an animation. So there we are. We have lots of questions and no answers. Well, no official answers anyway. Take a stroll through the forums and ask these questions and you will get an earful of ideas and conspiracies, some probable, some plausible and some impossible. It’s really all just food for thought and you will need to make up your own mind.